Growing up, we always had a rule at our house that you had to finish what you started. So, if you signed up for tumbling or band, you had to stick with it, at least until the end of the season. Then terms could be renegotiated. And it was a really good life lesson for me in keeping up with things. That is until this past Christmas season. I regret to say that I will be unable to finish my Christmas card project from 2014. That's a really hard thing for me to give up. I have sent Christmas cards every single year for about as long as I can remember. Even while I was away at college, I always had a list to cards to send, and loved going to the mailbox each day to check and see if I had gotten any in return. 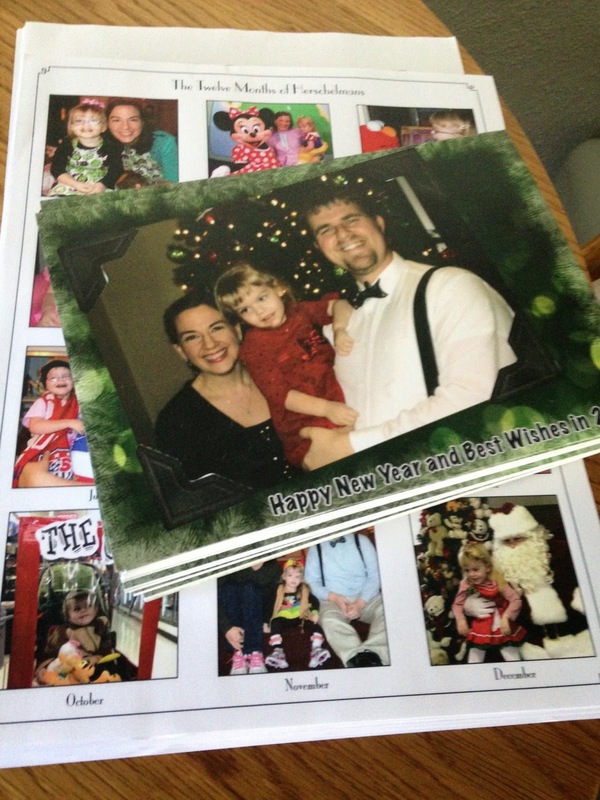 As I got older, my Christmas cards grew to include a holiday letter and even photos. And I always took time to write an individual note in each card. That's something that was very important to me. Well, as Grace's first Christmas came around, I found myself just about out of time in every corner. So, with a little encouragement from Kyle, I decided to work on them in the month of January. It's always a little bit of a slower time at the paper, and I vowed to work on a few each evening until I got them all done, usually around 120 or so. And for the past few years, that plan has worked out just great! Not only is it less stressful for me in the holiday season, but it also gives me the chance to include holiday thank you notes in many of the cards. So, instead of planning to work on them in December, I usually find a really cute photo of the three of us from Christmas and turn it into a card. I also got away from a holiday letter. The year before, we had gotten some unsettling results from Grace's MRI, and I couldn't bring myself to write a happy, cheerful letter. Instead, I included a sheet with 12 photos, one from each month of the year, and called it "The Twelve Months of Herschelmans." It was really fun to see how much Grace had changed from January to December. Well, this Christmas came and went, and I got started about making my cards just after the first of the year. I have a beautiful picture of the three of us all dressed up in front of the hospital's giant Christmas tree. I also got my photo letter done, and got both things printed out and ready to go along with a list of Christmas thank you notes to write. This year's unsent Christmas cards and letters . . . I brought them home from work, set them on the table in our living room where I would see them all the time, an inspiration to finish them. Then, January came and went, and I decided to make it my goal to get them done by Valentine's Day. It came and went too, and I decided to try to do them in the month of March. Well, now it's almost Easter, and I think I have to throw in the towel. Not that I haven't had good intentions, but at the rate I'm going, it just might be next Christmas before I get them all done. That being said, I don't like to waste anything, so I will be holding onto this year's cards and letters, since they're already printed, and including them in next year's Christmas card. Yes, I said next year. Because I'm really hoping to get back in the habit. It's one of my favorite things to do. Sometimes it's the only correspondence I have with a friend all year long, but it gives me a chance to tell them I was thinking of them. I already have a few ideas to expedite my usual process, including some mailing labels and a new address list. And Kyle has offered to help me too, because he knows how important it is to me. I still probably won't get them done in December, but I'm hopeful to have them done in the first part of next year. Who knows? Maybe I will even start some this summer. But there's still a chance I won't get them done this year or the next year. And that's hard for me. It's a project that I love, and I like to finish things I start. But times change, and some things inevitably fall to the bottom of the list. Even if I don't get them done, I know my friends and family will understand, and I'm confident they know I think of them whether or not I actually get my cards sent. Christmas will come and go each year whether or not I send out my cards, but it will still always be one of my favorite projects.